This recipe is one of my favorite ways to show off the pure flavor of red chile. It represents the perfect combination of cool, sweet, and spicy. 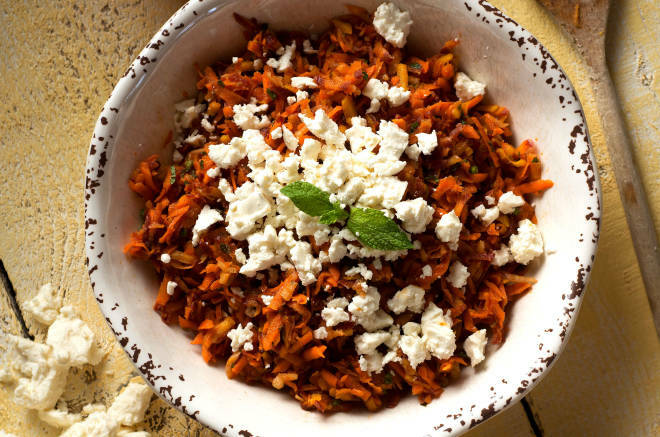 Use fresh mint and rainbow carrots from the farmers’ market for a more colorful dish. While the recipe makes a lot of harissa, relatively little of it is used in the salad. Slather the rest over grilled meat or vegetables. In a mixing bowl, combine chile with water and allow it to rest for a few minutes. Put chile and remaining ingredients in a blender. Puree until smooth. In a small skillet over medium-low heat, combine the oil, caraway seeds, and harissa, stirring constantly, about 2 minutes. Remove from heat, then add honey, lemon juice, and zest. Toss with carrots and mint. Cover and refrigerate for an hour or so to let the flavors meld. Top with feta, garnish with mint, and serve.